Today is International Women’s Day. 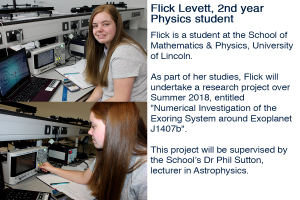 In celebration of this yearly event, we met with some of our female students to find out the projects they’re undertaking as part of their studies at the School of Mathematics & Physics, University of Lincoln UK. In addition, the women in science, engineering and technology group (WiSE@Lincoln) was set up at the University in 2012 to coordinate and deliver sustained support, guidance, training and inspiration for the Lincoln women in science, engineering and technology. The WiSE group is overseen by the Eleanor Glanville Centre, an interdisciplinary centre for inclusion, diversity and equality at the University of Lincoln.